The number of measles cases since the start of the year is more than three times that of the same period last year, but no deaths have been reported, said the Ministry of Health (MOH). In the first 11 weeks of the year, there were 38 cases of measles, compared with 11 cases last year. It is also the highest number recorded for the first 11-week period since 2015. MOH assured the public that there is no evidence of further spread of the disease in the community. "The majority of reported cases in 2019 were single and sporadic local infections, except for five separate instances of spread to a family member or close friend," it said. Measles, which affects the respiratory system and often results in skin rash, is highly transmissible among people who are not vaccinated. Measles vaccination is compulsory by law for all children living here, while the National Adult Immunisation Schedule also advises people who have not been vaccinated to do so. The vaccine is available at polyclinics, general practitioner clinics and private paediatric clinics. Of the 38 people infected this year, 25 contracted the virus locally and the rest were infected while in the Philippines, Vietnam, Dubai and Thailand. Children made up 14 of the cases. Nine were infants who had not been given the combined measles, mumps and rubella vaccine, and five, aged one to 10 years old, had missed their vaccinations. We need to pay close attention to the situation... 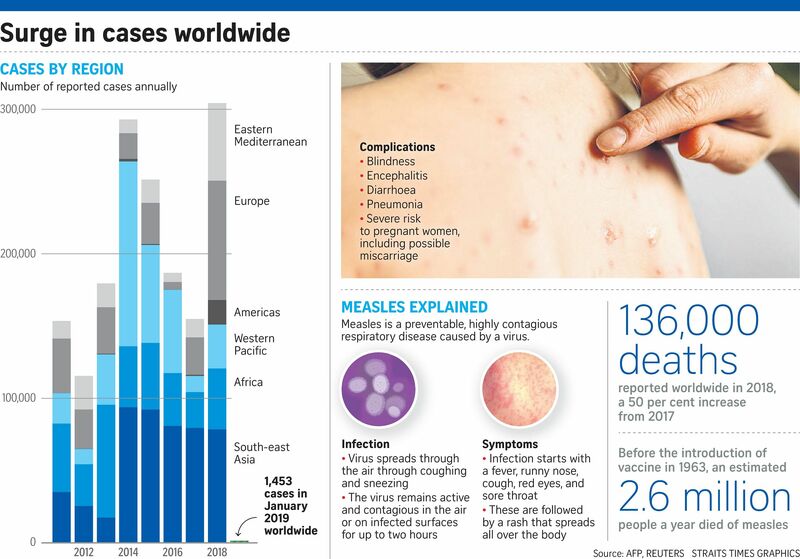 There is an increasing global trend of measles cases, including in many countries in this region. Singapore is well connected globally as a travel hub, hence we anticipate an increase in the number of cases. PROFESSOR LEO YEE SIN, executive director of the National Centre for Infectious Diseases. Among the 24 adults, 15 were not known to have been vaccinated. The ministry said that the majority of people who had measles since 2015 - for the first 11 weeks - were infected locally. It will continue to monitor the situation closely and has alerted GPs to look out for cases of measles, especially in patients who have recently travelled overseas or who have not been vaccinated, and notify MOH promptly. Professor Leo Yee Sin, executive director of the National Centre for Infectious Diseases, said: "We need to pay close attention to the situation. "There is an increasing global trend of measles cases, including in many countries in this region. Singapore is well connected globally as a travel hub, hence we anticipate an increase in the number of cases." In Ukraine, a measles outbreak this year left 11 people dead and more than 30,000 infected. The disease has also been spreading in the United States and New Zealand. The World Health Organisation said last month that scepticism over vaccines, conflict and poor access to vaccines had contributed to a worldwide resurgence in measles last year. Dr Ooi Say Tat, a senior consultant for general medicine at Khoo Teck Puat Hospital, noted that Singaporeans are generally well vaccinated against measles. "If one is uncertain about whether he or she has full immunity, one can go for a blood test to find out," he added.